What's Hot at The Knit Tree? Our Artisans offer you hand loomed knit caps and beanies in several styles from boarder beanies, classic skull caps, visor caps, and Peruvian style flap caps accented with camouflage and Native American Designs. Unique Knit Baby Blankets, Booties and Knit Baby Caps in traditional, Native American designs and camouflage are Always Hot! Enjoy looking through all the categories in The Knit Tree's online catalog for unique knit clothing and designs. We are adding new knit clothing and accessories often. 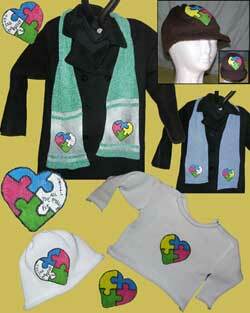 The latest is Hand Painting on Knits to support autism awareness. Popular Knits at The Knit Tree ~ Get them While they are Hot! Unique Knit Winona Camouflage Beanies are HOT HOT HOT! 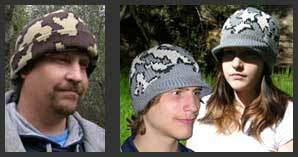 The Ridge runner, Survivor, and Floppy Winona Knit Camo hats made famous by Bob Fratzke are also available in The Knit Tree's online catalog. Knit Winona Camouflage Sweaters and Jackets are HOT HOT HOT! 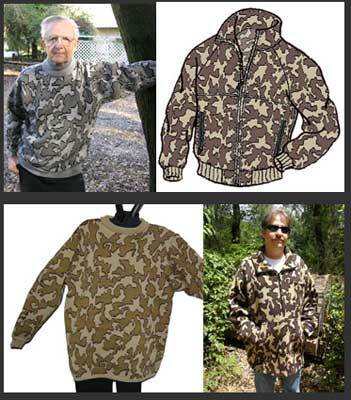 Knit Winona Camouflage Pullover Sweaters and Knit Winona Camo Jackets in several knit styles. The Knit Tree hand looms custom knit camo sweaters in our popular Winona Camouflage design in lots of color ways for hunting and fashion. In the image at the right are the camouflage pullover in the sunny woodland camo pattern,. Jackets are featured with zipper fronts in camouflage color ways, camo hooded jackets, hooded Winona Camo vests, and hooded sweatshirts with hand warmer pockets. 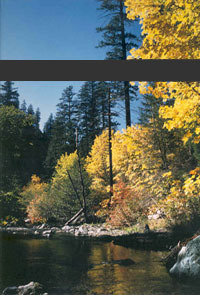 Many items are offered in versions lined with sherpa. Sharon Nani, owner of The Knit Tree has written several articles related to Knitting camouflage clothing and the history of Bob Fratzke and the Winona Knitting factory. See samples of the different Camouflage Color ways offered by The Knit Tree. and read about how The Knit Tree's knit camouflage clothes compare to Bob Fratzke's winona camo. The winona knit Camo Classic Cardi and Vest in both the lined with Sherpa and unlined versions can be purchased in The Knit Trees online catalog. "All Winona Camo items by The Knit Tree are produced under license derived from Copyrights originated by Bob Fratzke." Native American Designs are featured on several hand loomed knit blankets. 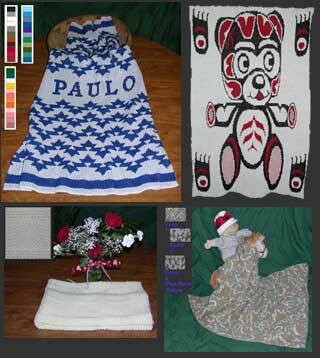 At the image on the right you can see the Pacific Northwest Teddy bear design and the personalized Morning Star design from the Hupa, Karuk, and Yurok tribes of Northern California. Knit baby blankets in Traditional designs of honey comb tuck pattern are offered in both cotton baby blankets and acrylic knit baby blankets. Knit Camouflage baby blankets in pink cotton camouflage and blue cotton camouflage along with the acrylic camo baby blankets polish off alot of unique hand loomed baby blanket choices. 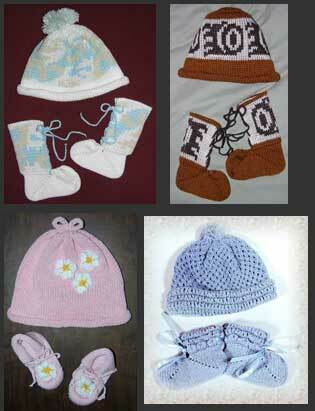 Baby Knit Beanies and Knit Booties are VERY HOT Baby Gift Sets! The Knit Tree loves to hand loom these special knit baby caps and knit baby booties. You can get knit baby caps and knit baby booties separately or as a baby knit set. The image at the left just shows some of our knit baby sets in the blue camo baby cap and booties, the Pacific Northwest Indian bear paw cap and bootie design, the traditional baby knit cap and bootie in the honeycomb pattern and the unique baby pink knit cap and bootie set which is embellished with little white daisies. Find a Unique Hand loomed Knit Baby Cap and Knit Bootie Set. Preserve the Historical Heritage of the Basketry Designs! Native American Caps from Klamath, Salish, Modoc, and Wintu Indian Nations. Unique Knit Native American Hats with Indian Symbols from Several Indian Nations Preserve the Historical Heritage of the Basketry Designs! These special symbols of Native American Designs and Heritage are inexpensive gifts in a wide range of cap styles. Each cap has special meanings dependant upon the inspiration from the Indian Nation from which it came. Sharon Nani, owner of The Knit Tree, will take personalized orders to put your basketry design on a knit item such as a cap, blanket or sweater Contact Customer Service if you have a special request of a design you desire to have preserved in a unique knit. 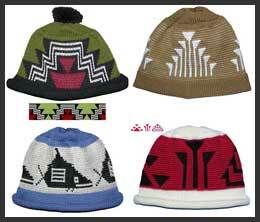 Pictured are cap designs requested from the Modoc, Klamath, Salish, and Wintu Native American Tribes. From left to right are the Modoc / Klamath Crows Knee Design, the Klamath Frogs Hand basketry design, the Salish Pacific Northwest Design of the Whale Orca, and Win River Casinos Three Affiliated Tribes Design. .
Collection of Knits with the hand painted autism heart puzzle. Go to our online store in the One of A Kind Unique Scarves category to purchase these Autism Awareness knit heart puzzle scarves and support Autism Awareness. If this scarf is already gone, check back, more will be on the way! 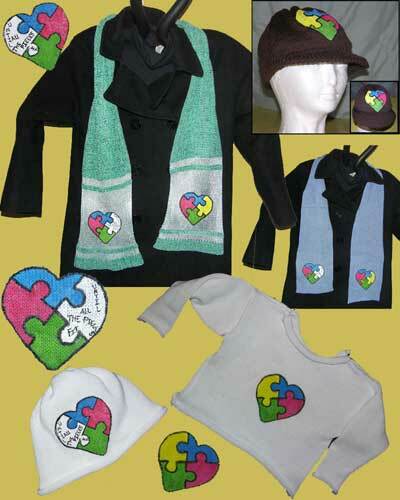 Autism heart baby clothes are found in the one of a kind >Knits for Babies and Toddlers category of The Knit Tree's online catalog. Our Autism Puzzle Heart Knits deserved as special category all of their own. Go to the Autism Heart Puzzle Knits category to find all the knits in one place. Read more about the artisan, Danielle Nani, mother of two young non verbal autistic daughters, and her home business knitting and hand painting these autism heart puzzle items and more. Here's a Hot TIP: Don't forget to use our Online Store Catalog Search Engine to find all the Unique knit clothing designs. ; Especially the Specialty Knits in Camouflage and Native American Designs which are available in baby clothes, children and adult clothing. Then search through our yarn kits and patterns for unique fabrics and yarns to sew, hand or machine knit yourself!